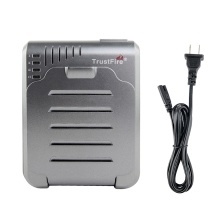 Compatible with many rechargeable battery, and 4 slots for quick and convenient use. Compatible for 10430, 10440, 18650, 14500, 18500, 17670, 16340 rechargeable battery of voltage above 2.7V. 4 slots for quick charging. Built-in DC and AC interface. Automatically cut off power after full charged. Charging time: 4-5 hours full charged for 4*18650Ah.